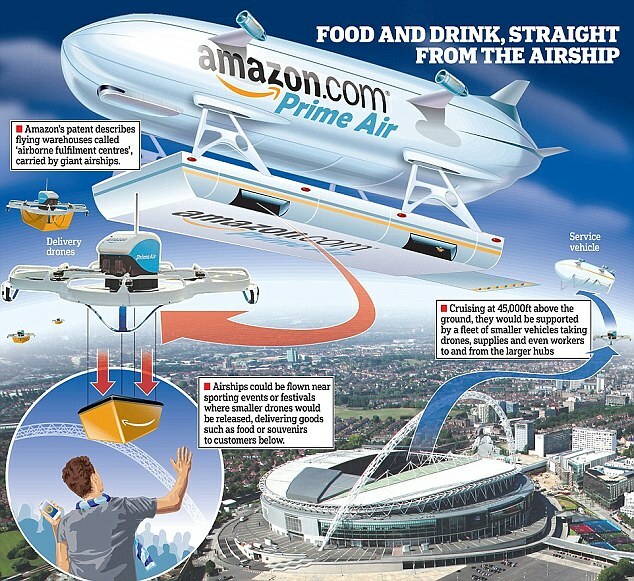 Amazon has plans for a two-storey, automated supermarket run almost entirely by droids. A staff of robots on the top floor will automatically grab shopping from shelves and bring it down to customers waiting in their cars below. This means that each store will only need to be run by a minimum of three staff at a time. The robot-run supermarkets are not Amazon’s first foray into the world of grocery shopping. The company unveiled a small convenience store in Seattle in December that uses technologies found in self-driving cars to replace cashiers. To enter the store, customers simply open the Amazon Go app and place it to a sensor located at the turnstile entrance. The app uses computer vision, sensor fusion and deep learning to detect what customers take off the shelves and what they end up putting back. When customers have found the items they need they can walk out of the store and everything is charged to their Amazon account. The ground-level of the prototype store is a supermarket-sized version of the company’s recently announced ‘Amazon Go’ convenience store. The supermarket’s huge layout could reach anywhere between 10,000 and 40,000 square feet and sell over 4,000 items. Items would include eggs, meats, cheeses, fresh fruits and vegetables, and ‘grab-it-and-go’ products like beer and wine, sources close to Amazon told the New York Post. Eventually, Amazon plans to roll out these robot-run stores globally. ‘Amazon will utilize technology to minimise labour,’ a source close to the situation told The Post. Amazon has already invested heavily in automation in its warehouses to cut down on staff. 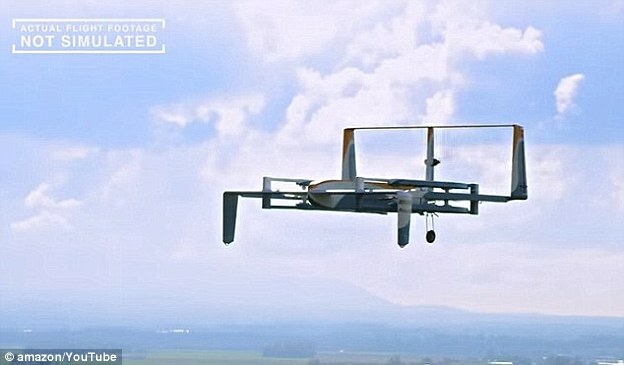 The company has also begun using drones for deliveries instead of humans, and has even filed patents for an unmanned blimp that could be used as a floating warehouse. But the latest plans could see a huge number of people out of work. The average supermarket today is run by around 90 members of staff. Amazon’s automated prototype supermarkets would be run by six staff at a time on average, the sources said. At a minimum, it could be run by three people. One worker would restock shelves while another two would work at ‘drive-thru’ windows to hand customers their groceries. Another pair would work upstairs to help the robots bag the groceries which would then travel downstairs on conveyor belts. 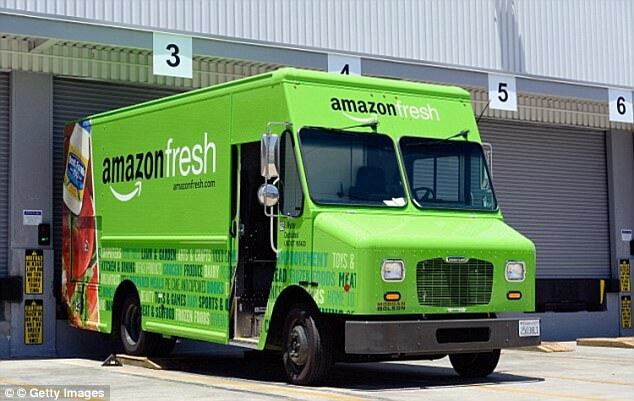 A manager would help customers sign up for the company’s ‘Amazon Fresh’ grocery service. Amazon could also employ ‘greeters’ to help curtail shoplifting at the thinly staffed stores alongside motion-sensing software to track goods. ‘Shoplifting is a touchy subject for Amazon,’ the source said. Amazon may only open its stores to members of its ‘Prime’ and ‘Prime Fresh’ services, which carry annual fees. ‘In the view of Amazon, people who can afford Prime memberships aren’t likely to shoplift,’ the source said. Using robots in the upper floors means that Amazon could pack for more items into a small space than conventional supermarkets. Each store could pack in 15-20,000 items at a time. With such a small number of staff needed to run each store operating profit costs of Amazon’s supermarkets could be above 20 per cent, the New York Post reports. With the industry average at just 1.7 per cent according to the Food Marketing Institute Amazon’s prototype could change the supermarket industry for good. The sources said that the project is still in its early stages and has not yet got the green light. Amazon denied any existence of a robot-driven supermarket chain when contacted by the New York Post on Sunday. ‘As we’ve said previously, it’s not correct,’ an Amazon spokesman said. Amazon unveiled a smaller convenience store in December in Seattle that replaces cashiers with technology found in self-driving cars. 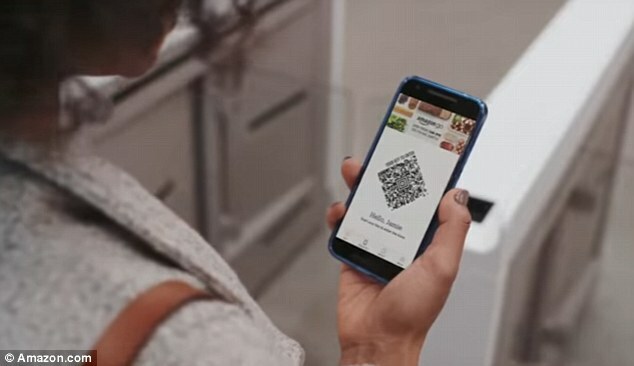 Called ‘Amazon Go’, customers enter the store using an accompanied app, grab the items they need, and are able to walk out without stopping at a register. The app uses a range of sensors that detect what shoppers take off shelves and bills it to their Amazon account. It is currently only open to Amazon employees during the Beta program, but is set to open to the public in early 2017. Amazon Go may sound like the store of the future, but this technology could also replace the 3.4 million people employed as cashiers if other physical stores adopt the technique in the US. However, an Amazon spokesperson told DailyMail.com that Amazon Go will ‘have at least as many associates as a traditional retail store’. ‘Amazon Go associates work in both the kitchen and the store, prepping ingredients, making breakfast, lunch, and dinner items, stocking shelves, and helping customers,’ they said in an email. 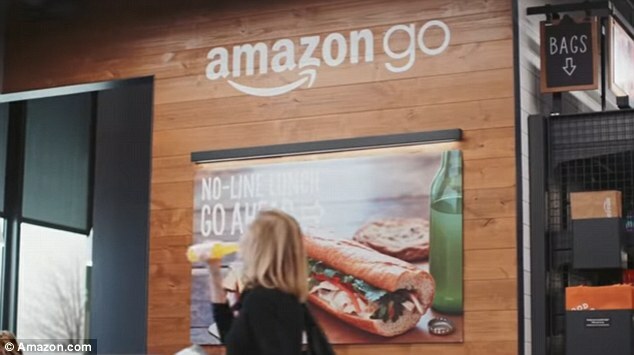 To enter the store, customers simply open the Amazon Go app and place it to a sensor located on what appears to be a turnstyle in the entrance way. 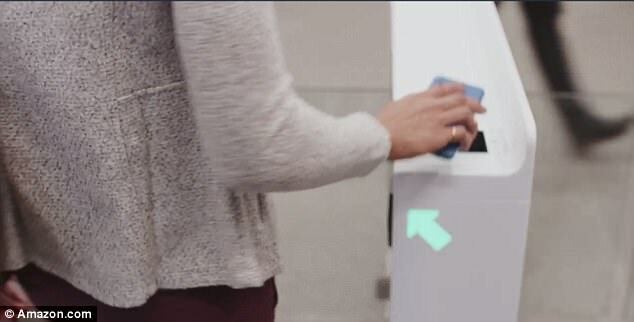 This technology also detects what items you grab from or return back to the shelve. Read more at DailyMail.